The emergence of gas stoves as an alternative to oil stoves certainly provides many benefits in cooking activities and it can help everybody cook their food faster. A gas stove is very easy to use and cooking with gas stove is much faster than using an oil stove. Though it offers some advantages, gas stoves also may also be dangerous if you do not use it properly. You probably have watched some news about stove explosions which can put people to death. Moreover, when you cook with a gas stove for the first time, you probably cannot cook foods well. So, you may consider these following safety and cooking tips for using a gas stove for the first time. Make sure you put the stove and gas cylinder in a flat and sturdy surface. Because if it is placed on an uneven surface or on a pile of other objects, the gas cylinder may fall which causes the hose and regulator to be pulled so that it becomes loose. This regulator loosens can eventually cause the gas to come out, even when you do not use it. So try to put a gas cylinder on the floor with a flat surface for safety. Many gas stove explosions occur due to the equipment used such as regulators, hoses, gas cylinders, and stoves that are not in accordance with the international standard, Therefore, check before buying. Make sure the equipment you buy has a standard label and it is not fake equipment. Don’t buy some cheap equipment that may have bad quality. It is better to spend more money to buy original equipment but it is safe to use, rather than buying cheap equipment but dangerous. Most of the gas stove explosions occur because users forget to switch off their gas stove. Cooking with gas stove must be aware of the use to avoid an explosion. It is not an electric stove that will automatically turn off when you do not use it. Cooking with a gas stove can be a bit complicated, especially if you are using a gas stove for the first time because your food may be overcooked or it is not cooked yet. In this case, you need to know how to adjust the heat. Not only that, but it may also depend on the cookware products that you use. There are so many best gas stove cookware (pots and pans) available for sale. Maybe, you are currently using an electric stove and want to try a gas stove. Anyway, cooking with gas stove vs electric is different. How to cook delicious food using a gas stove? First of all, when you decide to use a gas stove for cooking, you need to consider the types of cookware that you have to use. Basically, you can actually use any types of cookware when cooking with a gas stove. A gas stove is compatible with all cookware types including stainless steel, ceramic cookware, aluminum, copper cookware, cast iron, carbon steel cookware, and much more. This is the main benefit of using a gas stove. Somehow, you need to choose the best cookware to cook certain food. 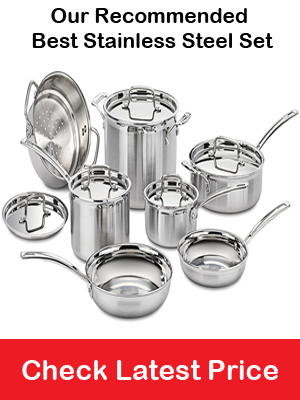 For instance, if you want to boil some water, you may choose stainless steel cookware or aluminum cookware. Meanwhile, if you want to fry eggs, you can choose the ceramic non-stick fry pan. Furthermore, you also need to pay attention to PTFE or PFOA because both of these substances are very dangerous for your health. In this case, you must check the cookware product before buying and make sure it does not contain PFOA or PTFE. When you usually use an electric stove or induction cooktop, you may be confused on how to cook meat perfect using a gas stove. The electric stove can work and adjust the heat automatically while you need to adjust it manually when cooking with a gas stove. You can increase the heat or reduce the heat manually. When you cook rice, you can cook it up to five minutes, and then you need to reduce the heat to warm it. Otherwise, the rice will be overcooked. Anyway, a gas stove can heat faster than an electric stove, so you must monitor it. But, it also depends on the type of cookware you use. For instance, the stainless steel may heat faster than aluminum cookware. So, if you boil some water on a stainless steel pan, it may only take 5 minutes to bold while it may take 10 minutes when you use aluminum cookware or ceramic cookware. Perhaps, you have no big deal whether you use a gas stove or electric stove because you already understand about it, but you still cannot cook delicious food. Anyway, cooking is not a simple process, so you have to try again and never give up on your effort. Maybe, you currently use the best cookware product, but it does not mean that you can cook delicious food. It is not only depending on the stove and the cookware product you use, but it also depends on your skill in cooking. So, you have to learn more from professional chefs or you can even find some recipes from the internet. Finally, those are some tips for cooking with a gas stove in term of safety and food quality. Whether you use a gas stove or electric stove, you can cook some delicious food as long as you choose the best cookware type that you can buy in the market. When cooking with gas stove, you also need to pay attention to the usage to avoid an explosion. You also need to understand how to adjust the heat to avoid overcooked food and choose the suitable cookware type for a gas stove.